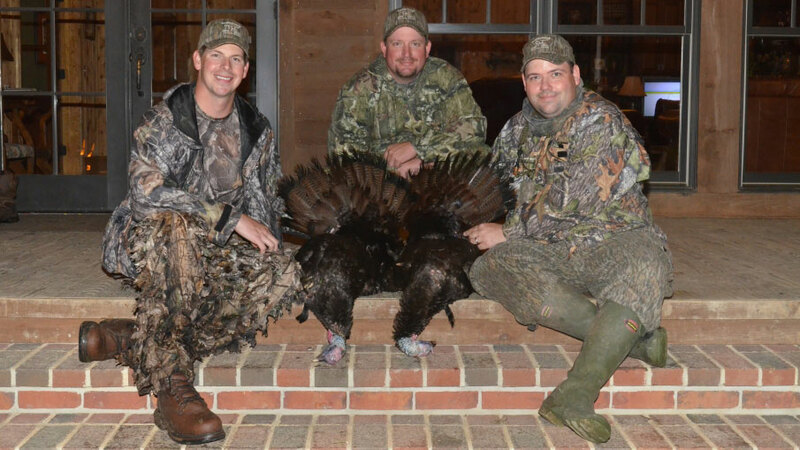 Gilbert (right) and Jack Robertson (center) are partners in Houndstooth Game Calls. The author (left) has seen firsthand how deadly Gilbert's calls are. 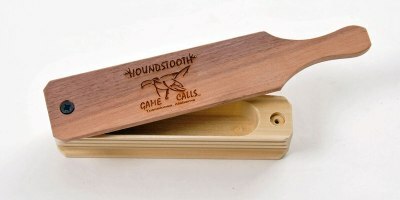 The adage “they don’t make ’em like they used to” can no longer be applied to the turkey call business. “Making them like they used to” implies that the product at hand was made with a sense of care, pride and a high degree of quality, three things that largely went by the wayside with so many things that are manufactured overseas (we’re looking at you, China). At the same time, though, these same companies have had to shift production overseas to cut expenses and stay afloat, but at what cost? Often their reputation and quality control. The outdoor industry — and turkey call makers in particular — has been part of this shift, but there still exists a contingency of homegrown craftsmen who value their brand and reputation too highly to mass produce anything. One such maker is Lyle Gilbert, founder and proprietor of Houndstooth Game Calls, based in Tuscaloosa, Ala., hence the Houndstooth moniker. Gilbert has been manufacturing calls since 2004 when he learned woodworking from master woodworker Alan Mattox. Gilbert learned Mattox’s craft and, since the pair were avid turkey hunters, a natural progression to creating calls played out. Gilbert never had any issues with making his products sound like a hen turkey, given his lifelong obsession with turkey hunting and stint as a professional guide. But making a marketable call that looked good took some fine tuning. For Gilbert, making calls for himself and friends was a fun and rewarding hobby, but as others heard the sounds his calls were producing, the market came knocking. He didn’t make calls with the intent of selling them initially, but as word about his work spread, Gilbert’s phone rang more and more steadily. His mantra of “function first, then form will follow” spills into every category of call he makes. “I was so hard on myself in the quality of sound that I later realized all you need is a workhorse call and the market will find you,” he said. “My mouth calls, for example, are stretched on gauges that perfectly stretch the latex to the proper tension. In his inventory, Gilbert keeps roughly 10 different variations of diaphragm (mouth) calls, a ceramic and slate pot call, tube calls, a jam-up owl hooter, duck and deer calls and his favorite, the trumpet call. Just about every call that Houndstooth produces is touched by Gilbert himself. If you’re looking to put a title on him, it could be a dandy: CEO, quality control, customer service, accounting and shipping. But that’s likely leaving a few roles out. His wife, Summer, helps with bookkeeping while his oldest stepson packages and is an up-and-coming woodworker on his own. His youngest son helps with packaging as well. Gilbert’s calls are made first and foremost with an eye toward producing genuine turkey sounds, but a few of them are aimed at those somewhat new to the world of turkey calling. His Tom Bomb mouth call is one of his most popular calls simply because the learning curve of it is shorter, therefore it can make a beginner sound like a veteran in a hurry. Also in demand are his friction calls, both slate and glass. His up-and-coming star, though, is his wild green owl hooter, which is making waves as well as making turkeys gobble. Check out their Facebook page for lots of info.